​Cierre Wood spent his most successful years of his football life in college. 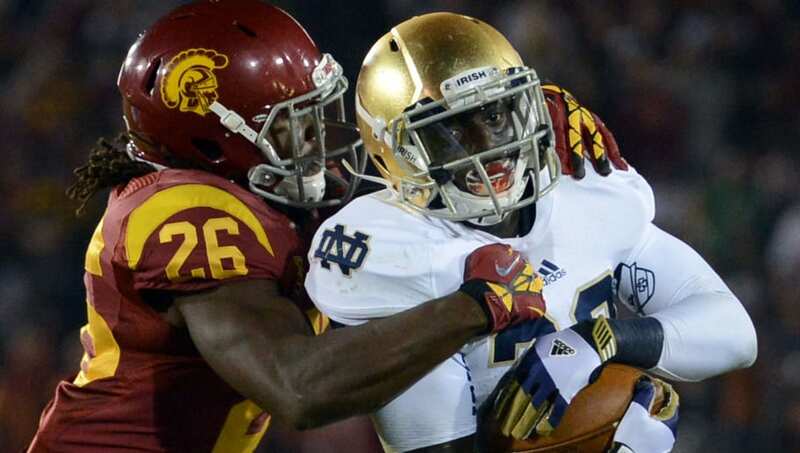 A star at that level from 2009-2012, Wood compiled 2,447 rushing yards and 16 touchdowns in three years at South Bend. From there, he saw very limited work in the ​NFL, mostly as a practice squad player in three seasons. Those years, however, are now clearly far behind him. Wood is in jail facing charges of child abuse stemming from the death of his girlfriend's five-year-old daughter. Considering the heinous nature of the charges involved, Wood's fall from grace appears to have taken a turn for the absolute worst, ​yet another former college star lost following a downward career trajectory. Currently being held on $5,000 bond, Wood is in jail alongside Amy Taylor, his 26-year-old girlfriend and mother of the child. She is also being held in connection with those same charges. Shortly the child passed away in a Las Vegas hospital on Tuesday night, the arrests were made at the hospital that same night, as it became more apparent to authorities that something was amiss. More details to follow, surely, but condolences to those who loved the tragic figure at the center.